Sammons has made it very clear that students need to feel like mathematicians and to connect math to the real world. This year I plan on starting off my year using this product that is a great way to start off your guided math school year. Students discuss what math is, who uses math, and why math is important. 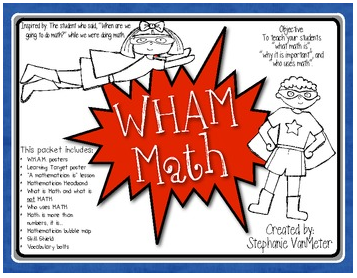 It is great for setting the tone for your math block! Not everyone is going to have a group of teachers at their school to support them in their journey to use Guided Math in the classroom. Luckily in today's world you can turn to the internet where you can join message boards, groups, and even blogs to troubleshoot, ask questions, a look for help. Having a support system is important for when you "hit the wall" and feel like you have exhausted all of your options! Make sure to enter the rafflecopter below and to check out the rest of the blogs below!